60 Gal. 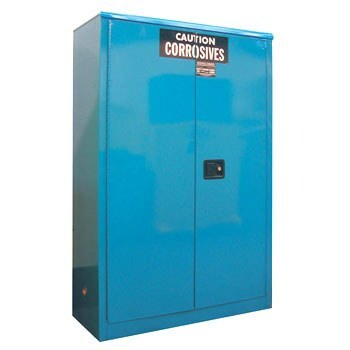 SECURALL Acid and Corrosive Storage Cabinets with sliding door safely stores your flammable and nonflammable acids and corrosives with peace of mind. Leak proof, galvannealed steel shelves and bottom are lined with removable polyethylene trays that provide easy clean up in case of accidental spills, and the shelves are adjustable. This cabinet is not recommended for storing Nitric or Sulfuric Acids unless used with PE3045 Polyethylene Cabinet (sold separately). Complies with current OSHA and NFPA (Code 30) regulations. 15 year warranty.